Here’s a fantasy vision. Nothing to do with snow or twerking or New Year Resolutions. It seems particularly that of an engineer: not that of a journalist or scientist or even of an oceanologist. Tell me I am wrong, go on. In the newspaper piece, the headline was “Five trillion pieces of plastic in seas are damaging food chain”. It told of many findings and repeated, as well as much else, previously mentioned topics such as how such rubbish accumulates mostly in five large ocean gyres. There were interesting maps of distribution by particle size around the world’s oceans. The piece was based upon a research paper from the University of Western Australia. Now I did not look, deliberately, at any of the internet, below the line comment. It might have spoilt the pristine enthusiasm of the moment or even destroyed the fantasy with facts, [though on line there are usually more abuse than facts]. Now here is the skeleton of a vision: triggered by the scenario, a Global Project envisaged by this engineer. If we can pick it up in the gyres once, the material that is remaining elsewhere will after a suitable period be ‘sucked into’ or go into orbit around the gyres again. So we go extracting to the same place later. [Second Project question, “Will we need to do it more than once? It may affect the engineering, if not]. The propulsion of extraction vessels, like most other things in this world will need energy and power. This will be a significant cost apparently and affect the details of the Project. They will be sailing in the open ocean. [Sixth Project question. Can the vessels be solar or wind powered?]. The crew is another major cost in operating ships at sea. Could we dispense with them? We could plan to use of a fleet of autonomous, radar visible, small ships: they could perhaps be small and launch size [Seventh Project question. Ask the academics in the robotic field if we know enough yet to design and set up a reliable fleet]. Well, there you have it. That’s as far as I have got as a first stab. Cost and economics are probably more central than the technology. I imagine the latter is already in sight. As an international good it does not necessarily have to make a profit. Now go on then: en primeur, nothing more. Have a think about it, but give it a fair wind with a constructive approach. There are probably at least a dozen more major Project questions.. I fancy that there might be a feeding frenzy of the critics but may be the Project or something like it could be done. By the way, along the route of the text of this piece there is a screech about this plastic weighing “more than the entire biomass of humans”. Shock! Horror! No, it’s not good but my first thought is that, at an estimate of 269,000 tons, this is about one or maybe two big, modern container ships. Think how many ships are afloat and then think of the weight of the buildings erected by the human race. Our biomass is, to not mince, words a stupid measure worthy of the worst Greenpeace hype. The structural engineer Bill Harvey, @BillHarvey2 on Twitter followed by The Lad, is one of the few, practising engineers on the social websites. Once, when The Lad made some hard, unjust criticism of a video promoting engineering, he suggested cutting some slack. Slack, though justified there, is seldom available in daily, real engineering and here are a few examples. They are five and random: three small scale, one serious and one lethal. In the wrong place though, even small errors, if not picked up, can create dangerous havoc. Anything ever designed offers chances of error. Mostly engineers design machines or components for a particular function. Often the upshot is they do something else, such as fail, much better. ” Damn it!” [usually worse]. “Try again” The profession of engineering is vastly important, difficult and usually misunderstood by the media. All modern engineers know about metal fatigue failure. Loads and low stresses may not break a piece applied once, but if they are often repeated can still cause breakage or cracks. It is a danger always lurking to spring on the unwary design engineer. She designs out sharp internal corners because of the stress concentration can encourage a fatigue crack: so she designs in a nice large radius. Ah, but fatigue is pushed only one step further away. 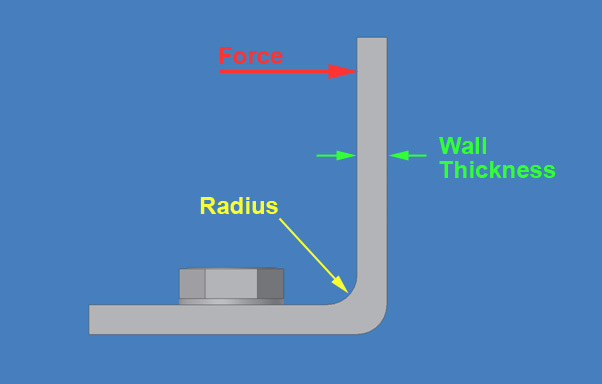 For how is the radius to be machined? If the manufacturing process or careless handling allows a scratch to appear: boom, even higher stress concentration and fatigue enters again and takes it’s position centre stage. Then there used to be this massive pile of print-out. Fifty sheets were common. Cover of a map-folded print-out pack of stress analysis results. Do you believe what is printed on it? 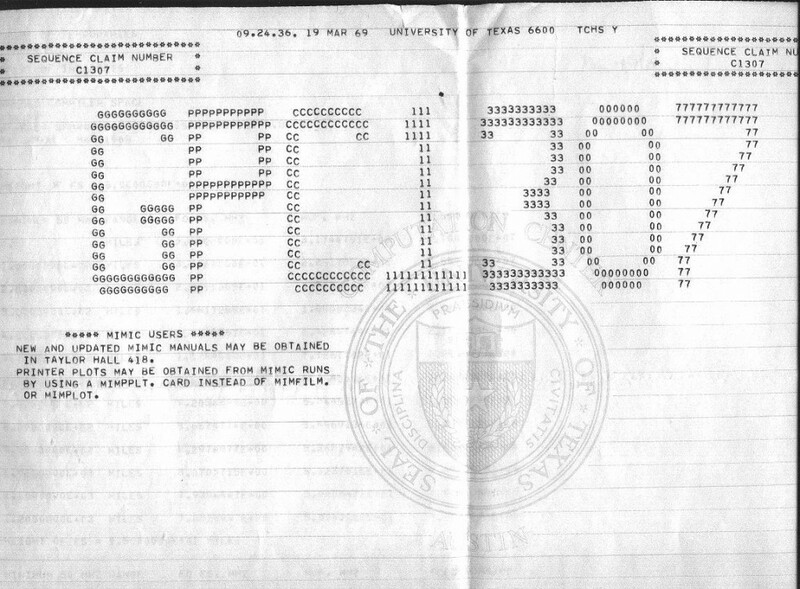 Arbitrary sample of Fortran results, frequently 50 pages of this. In those days massive piles of map-folded printout was a product of the batch operation of the Mainframe on the air-conditioned wing of the ground floor. We had to be wary of the ‘never mind the quality: feel the width’ syndrome. Quality of the answer depends on the assumptions fed in, Watch out for GIGO, ‘garbage in: garbage out’. A colleague was obsessing over the stresses and forces in an hydraulic system and was greatly worried about one static pipe element. 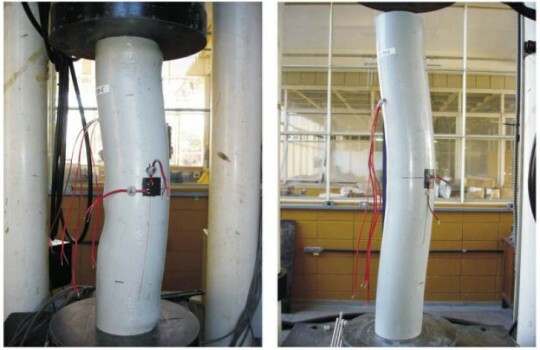 In one scenario, a transient increased the compression forces up to enough to buckle the element. These are tubes or pipes buckling under end loads. Buckling is bad was our usual rule of thumb. The chief stress engineer asked “Where is it and where is it going?” The eloement was passing through a small, fitting clearance in a hole. If it buckled, all it did was just touch the side. No problem, move on. 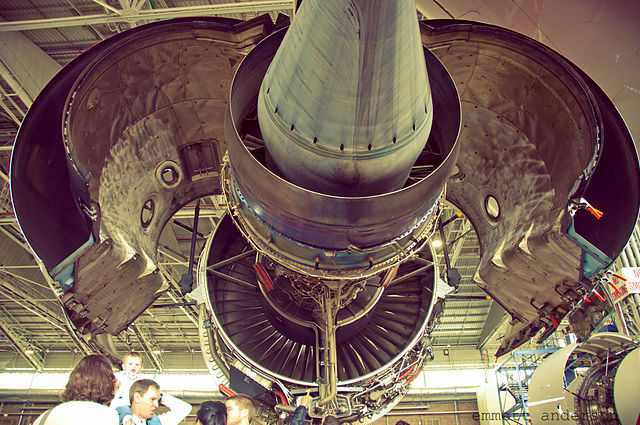 Modern gas turbine engines power most of the aircraft in which we are flown about the globe. The gas turbine prime mover is very different to a piston engine. One aspect is the compressor which compresses the gas before fuel is injected and burned. The compressor, made up of rotating discs with many blades, is to the left and the combustion chamber is to the right. This job is also done in a piston engine when, before fuel injection, the piston compresses the air with little or no leakage possible around the piston. In the gas turbine there is a potential convoluted leak path backwards[to the left in the photo] between the blades. In a normally running engine, this leak is only avoided at optimum speed because the rotating compressor with its carefully designed blade shapes pushes air, compressing it as it goes, to the right towards the combustion chamber. Operating the engine at non-optimum speeds (say, start up or acceleration at take-off) can result in airflow slowing and the pressure at the right side growing too high. Then, with a large bang and (if repeated) highly expensive, blade damage, flames rocket out of the front and rear of the engine. Only very careful engineering design based on extensive experiment can stop these explosive forces. There was a new design of bridge called a Box Girder. Instead of chains, frames or cables, it had a large hollow section to bear most of the loads. Without too much simplification, we can see that this had two advantages. 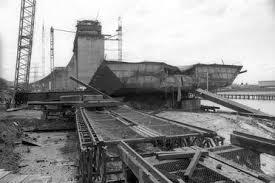 Such a large, closed shell was very strong and stiff which is just what you want for the deck of a bridge. Secondly, such a smooth design promised low maintenance as a very large part of it, the inside, was protected from the weather. 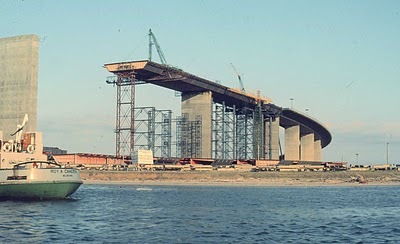 The West Gate Bridge in Australia was such a design. High in the air supported by piers, the box section can be clearly seen. Trouble is, being very stiff (that great advantage), it is difficult to assemble accurately on site and align when installed. Sadly at West Gate in a fatal misjudgement, what were seen as the necessary tweaks to get sections to fit accurately only overloaded the bridge sections. They buckled and crashed to the ground. Over thirty men lost their lives. Engineering is, and always will be, hard. You want challenges? Be a professional engineer. Posted on March 28, 2014 Categories Current News, Design in the World, Engineers in the WorldLeave a comment on Hard game, Engineering. It was Saturday, the Fifteenth day of March in the Year of Our Lord Two Thousand and Fourteen and The Lad hied hence to the Great Wen for the First Anniversary of the Institute of Making, scion of the esteemed University College of the University of London. As the sun shone and spring peeked shyly, like March hares the inhabitants of the Metropolis were mostly hurrying about their business. They had that characteristic air that seems as though it stems from suppressed hysteria. Not wishing to appear too eager, he arrived about half an hour after the opening time. The queue was already nearly 100 strong waiting to replace those already within. The majority were families with pre-teen children of both sexes. It took about 45 mins to arrive at the front of the queue, the wait eased by free coffee and both nitrogen-made and conventionally Cadbury’s 99 ice creams. A ‘Generation Y’ passer-by wore a sweatshirt emblazoned with ‘UCL Parkour Club’: disappointingly he was walking and not progressing by somersault or bounding off the buildings. More intellectual fare was provided to pass the waiting time with one popular project of paper plane folding and flying competition. Another project was a competition to blow the largest bubble-gum bubble. ‘Maker culture’ emphasises learning-through-doing (constructivism) in a social environment. Maker culture emphasises informal, networked, peer-led, and shared learning motivated by fun and self-fulfilment. Maker culture encourages novel applications of technologies, and the exploration of intersections between traditionally separate domains and ways of working including metal-working, calligraphy, film making, and computer programming. It encourages people to make things themselves: frequently using traditional hand or machine tools. A higher consciousness can lead, seems to be the overt belief, to better products than the original artisanal user could achieve. The Lad saw it as a “neo-Arts and Crafts Movement”. Professor Mark Miodowski and all his student helpers wore a uniform of unpretentious, dark overalls. This may detract a little from efforts to move the making or engineering image, all too common in the media, away from that of the spanner and oily rag or hard hat. Many were female engineers, and obviously and encouragingly, seemed to well out-number the males. A contingent was from the USA, notably speaking using Imperial inches. Seemingly, with the large lifting platform and the Gantry crane, the whole working space appeared to be an impressively recycled or re-claimed loading bay. Samples of over a hundred materials were displayed and numbered, nicely lit, along the walls: mostly of simple cubic type forms but also some component parts. There were, deliberately apparently, no naming or data visible for the samples. ‘They’re on the app’ only. It was though OK, possibly even at this stage encouraged, to pick them up and handle them. Certainly it is a Twenty-First Century version of the 17thC Cabinet of Curiosities. Then there were hands-on experiments. One was BluTack weighting of He filled balloons. Another and very popular, was the chance to make a mould of small keys and the like in thermal resistant and insulating cuttle bone. Into this the helpers poured hot, molten pewter to make for you your own cast metal model. In the Make Space area hung on the wall was a collection of 50 or more hand tools, without duplicates, hung on the wall. There were saws, files, squares, scribers and mallets. From a distance through the crowd, all seemed to be pristine and unused. But the only vice visible was a woodworking type on a carpenters bench. No sign of a strong metal working vice that would be needed to use most of the tools properly. There were a small number of simple machine tools: a new woodworking lathe, an emery belt machine and some tool-grinding wheels. Up in the mezzanine level, there were three 3D printers: those devices that, according to many in the media, are going to transform Manufacture and Commerce by way of a new Industrial Revolution. They were making 2cm-3cm plastic red pigs and green frogs. Anything bigger would have taken too long, it was said. These machines seemed, software driven as they are, to sit paradoxically with the hand-making aesthetic of the rest of the Make Space. A sculptor was asking about the possibility of making multi-coloured maquettes. He seemed to conclude though that he had more feel making them by hand. Judging by the number of people attending, 50:50 adults and children, the occasion must be seen as a success. The Lad retired to the womb of the Lamb and Flag to revive with ale his weary legs. Then, after admiring not only Boris Bikes but – even more – paramedics on mountain bikes at St Pancras station, he repaired again to the North. Professor Lisa Jardine of University College London hosted a series of seven programmes on Radio 4 recently. Called “The Seven Ages of Science”, it was a cultural-historical take on the progress of Science through the centuries. There were plenty of thought-provoking angles on what we thought was a fairly well-trodden story. The Lad is, like many others, concerned and puzzled at the current, image of the profession of engineering in the public prints and public imagination. Can the Cultural Historian bring some specialised tools or a different standpoint to the story? Has it been done already? Is there a PhD in it for some post-grad or even a radio or TV programme? Engineering is defined as manipulating forces for our benefit, starting from erecting first shelters through to, take your pick, nuclear power, wind turbines, building CERN machine itself, etc., etc.. Yet many see engineering having only the ’oily rag’ image. Or the image is either vanishing or, at best, subsumed into that of ‘scientists’. Some vignettes through the Ages could include the contemporary reputation of Roman engineering and engineers (perhaps via Professor Mary Beard); the initial division between scientists and engineers during the Renaissance [or was it later]; engineers in the Lunar Society; commercialisation of the steam engine by Boulton; Edison’s first Applied Science laboratory. There will be many other vignettes that The Lad has not thought about. After all, he is only an engineer not a cultural historian. Perhaps a rousing climax could address the claim of some software writers in I.T. to the title of ‘Engineer’. Have they seen it as a derelict title that they quite fancied? From this view, have they then arrogated the title to themselves? The engineer, when she is working in engineering, uses the physical forces that exist in the natural universe. Thus she is subject to the laws of Newton, Faraday, Carnot, Clausius, Maxwell and others. The software writer on the other hand is subject to no such Laws. Her work inhabits a different space: a space that is not subject to the same constraints. It is only making marks on paper or specifying switches to be opened or closed. Her only limitations are those in the ethereal: far boundaries only set by such as Gödel’s theorem on undecidable propositions;é such as Wittgenstein’s statement that “Whereof one cannot speak, thereof one must remain silent”; and such as the Kantian ‘phenomenal world’. It is a range so wide that it is almost impossible to imagine other than as ‘anything is possible’. Consider the computer games and the Star Wars films and the Star Trek ships that go to warp speed. They may from their visual complexity make a pretty good fist of looking like a real, complex, space structure. More, at least, than those of Flash Gordon’s V2 like rockets. But have they been designed so that they could work in the real physical world? No they haven’t. It has been said that if it looks like a duck walks like a duck and it quacks like a duck, it probably is a duck. To some, coding apparently looks like engineering, walks like engineering and sounds to them like engineering, so it is engineering. Its champions have been mainly brought up in the world of Microsoft and Google; do they know what engineering really is? Whereas coders, logicians, can operate like the pilots of an aerobatic plane, engineers are struggling in the city and its streets. Coding has the glorious flexibility of dreams; engineering needs the stamina of the London Marathon runner. Professor Lisa, can you offer us a refreshing draught of a new view? Posted on September 26, 2013 Categories Current News, Engineers in the World, Uncategorized, Views2 Comments on How many Engineering Ages? The handle that opens the dishwasher door broke off today. It almost scrapped the machine. If you can’t open the door, it is useless scrap metal. The internal structures and rotors of the washer fight corrosion and stress throughout its life. Even when it is stopped and not in use: no – ESPECIALLY when it is stopped. That’s corrosion. A lot of engineering effort have gone into these internals and the outer, white-enamelled shell. It happens time and time again to engineers. The team works hard to get the core of the machine right. At the end, the team leader sighs, ‘Phew!’, she says ‘Well done, guys’. What happens then? Something outside the core goes wrong, that’s what. In the handle mechanism, there are steel links to take quite high latching loads. On one link is mounted a plastic moulding for the fingers which clearly has some bending in it. It broke; so too much it seems. Or it’s just old-age perhaps. Anyway, now with strong fingers, you can still move the bare linkage and open the door. With weak fingers though, the door stays locked and you are done for. It is a machine still just working– but getting close to useless. It happens all the time; sometimes more painfully than when it is on a dishwasher. There was a small component once on a new design of £multi-million aero gas-turbine. It had just gone into service. It was festooned with the good results of testing that had cost many, many more £millions. The component probably cost about 0.001% or less of the cost of the whole engine. One machining process in the part was badly controlled. Cracks appeared. The component failed. Oil leaked out and caught fire in the engine. The turbine exploded in flight and nearly brought down the plane with all its passengers. All the engines – and their aircraft – had to be grounded. The cost was a fortune in treasure and reputation. The jet engine company survived the cost of the problem but a taxi steering box problem bankrupted its maker. The London Taxi Company had been struggling with financial losses for some years. Then came a serious problem with the steering box. The detail of the problem was never made public. Now the cost of the steering box is only a very small proportion of the cost of a black taxi compared to the engine and body. It is, though, a vital safety assembly in that it is a link in the steering system. When the problem was found to be present in taxis on the road, many hundred had to be recalled and repaired at the expense of the London Taxi Company. The financial burden of this process drove the Company into administration and most of the workers lost their jobs. After a few months of suspense and, no doubt, negotiation a Chinese car firm, Geely, bought it out. The original manufacturer in the UK of the steering box claimed that the problem arose in the box only when it was taken away and out-sourced to, strangely enough, China. When the manufacture was repatriated to the UK [back to him, the original, of course] the problem went away. The engineering devil is ALWAYS in the detail. If you can’t touch it, how are you going to use it? BBC had a piece in early August 2013 on ITER or the International Thermo-nuclear Experimental Reactor. This is the new, globally international project, similar in size to CERN based in the south of France, to develop fusion power. OK. Let’s assume that we can get fusion to work for a useful period. How are we going to get the [expletive deleted] energy out? Are you listening to me, ITER? Course they aren’t. Engineers and scientists have been working on the myriad problems for more that 50yrs. They don’t need the help of The Lad. But some students, general public and certainly the meejah might. Here’s an engineer, The Lad, putting his head on the block. He is venturing into an engineering place in which he has no specific expertise: no change there then. He just thinks in general terms of engineering forces. At least this is more than do most bloggers and general media. Remember, it is the working with physical forces that defines an engineer. Fusion will only occur at temperatures that transform anything into stellar plasma. That includes ANY solid structure trying to contain it. Such energy by transmission of heat, in quantities difficult to imagine, will sublime any structure that it contacts. Here is what happens now for most of today’s prime movers. There are several heat sources in current use; such as oil, gas, coal, wood and nuclear fission. 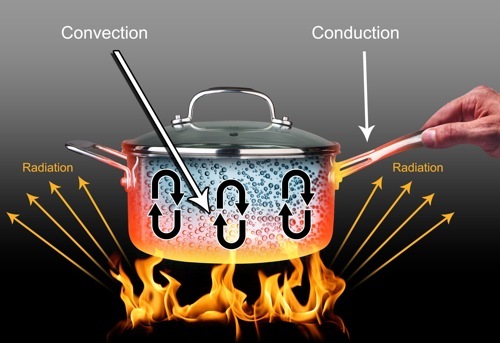 This heat source drives the heat energy by conduction; moving energy by interaction between atomic particles. The energy passes through a pipe wall so as to heat water or gas or some other intermediary. This expands and drives a turbine or piston engine or hurtles out of the back of a jet engine generating a useful reaction. OK. It’s currently impossibly difficult to get fusion to stay ‘alight’ for more than split seconds [or am I already out-of-date?]. Anyway that is the reason for the €billions being spent on ITER. If we assume that we will be able to improve on this; what then? Now we need to get the energy out. If we try to drive the energy though a pipe wall by conduction from a fusion plasma cloud, the pipe will melt it in a millisecond or less. So – not conduction then. In boilers, both domestic kettles and Drax power station plant, they use conduction. Here bulk gas or liquid move themselves as well as their energy. Both bubbles and hot water rise because they are less dense than the surrounding water. This leads to mixing and heat transfer; producing steam for turbines driving the generators. Thanks, Archimedes. It so happens that this is also the way that radiators [a misnomer: they would be better called ‘convectors’] warm a room in a house. Sorry, we cannot use convection. Why? 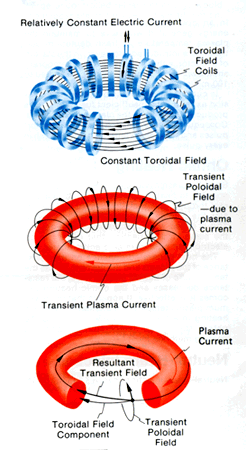 Precisely because plasma is carefully arranged to be closely contained in a doughnut-shaped, Magnetic Bottle [part of a Tokamak machine]. This is a magnetic field that is designed precisely to stop the searing plasma from churning about where it is not wanted, i.e. touching anything solid. What can be done? The Lad thought that he was asking a very difficult question. But then, it transpires, not so much. He remembered that engineers recognise three standard ways to transfer heat energy: conduction, convection and radiation. So if it can’t be conduction or convection what have we left? It must be radiation where heat energy is transmitted like light or radio. This is how warmth from the Great Fusion Reactor in the Sky [as Alan Partridge might refer to, of course, the Sun] gets transferred to us on Earth. There will be a ridiculously intense, thermal heat flux. Not only that though, there will be an equally ridiculous flux of nuclear radiation that will, itself, hammer at the structural integrity of the whole machine. For ITER there is quite and impressive technical illustration here. Not a drawing,note: it’s an illustration so a lot can change. While everybody that The Lad has seen talking about ‘limitless fusion power’ speaks of the fusion reactor generating the power, nobody seems to talk about getting out for our use. It seems to The Lad, radiation it has to be. But in detail how is quite another question. It is an equally giant problem. After all solar panels or black radiation absorbers on the roof of your house won’t hack it. But don’t worry. Let the scientists get the physics of fusion and plasma nailed down and you can rely on the engineers to turn it into Power Stations for the benefit of us all. Posted on August 11, 2013 Categories Current News, Design in the World, ViewsLeave a comment on DIY Fusion Design 101? Oh yes – from the last post, who is this Sir John Rose? He stood down from RR at the top of his game in a blaze of glory in March 2011 after having been with the firm from 1984 and Chief Executive from 1996. He is one of a small group at the top of Rolls-Royce plc who, over the last couple of decades have transformed the engineering company. It has changed by expanding its product ranges, entering new markets whilst retaining a global reputation and financial strength. The striking thing, at least to The Lad, is that he was apparently not trained as a professional engineer. The Daily Telegraph newspaper related that, born in Africa, he came to Scotland gaining an MA in psychology; it is not clear whether that was the subject of his first degree. Then he went into banking of all things. Eventually he fetched up in 1984 at RR. Note that in mid 2013, that share price has doubled again. This is in global engineering. That thought floodlights the churning in the modern, economic world: much of which is as useful to UK prosperity as the driven fluff. There was much more: it was a fabulous fighting speech. Read it and run with it. The Lad found it striking but significant that in all the video footage of the speech he found on the net, the beginning has been cropped and only starts at the paragraph that has the first mention of “… politicians, economists and commentators …”. Good Grief, so many of the media only twitch or open their eyes when these people are mentioned. 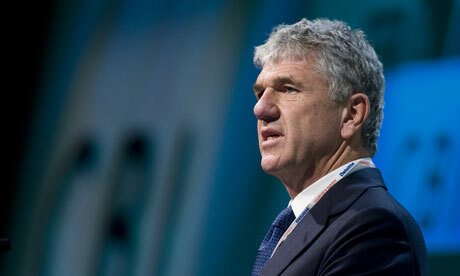 There are other points about John Rose’s term as CEO of Rolls-Royce plc. On his watch the preferred principle of commerce with airlines changed and the RR business model changed with it – for the better. Engine makers, during most of the Twentieth Century, sold their machines to the aircraft makers and, in the aircraft, on to the airlines. The airlines had their own engineers to maintain the engines, repair them as necessary and to buy new engines when they reached the end of the engine life. All this is a continuous, organisational, burden for the airlines. This approach was replaced by a new model: “Power by the Hour”. In effect the engine maker promised that he would take the full responsibility to provide the necessary power in the aircraft. It is not clear whose idea “Power by the Hour” was originally but certainly it came to full, Roll-Royce flower under his leadership. It lead to increased engineering design emphasis on reliability and easier maintenance now that it affected the RR financial performance directly instead of being sloughed off onto the airline. The Lad is reminded of a saying that probably dates back to Henry Ford “An engineer does for 50c what any fool does for a dollar”. It was a win-win result. The airlines were more comfortable with a cash outflow that did not vary [accountants do not like uncertainty] and, as a result, RR got more engine orders and its financial turnover grew massively. He likes less what an accountant once told him. An engineering business [or any business for that matter] is merely a process linking buying money cheap and selling it dear. In the heat of recent financial meltdowns, that seems to be too abstract, ungrounded and risky. All this is engineering too. Engineering is one of the three drivers advancing the human race. This blog describes professional engineering in the real world as it is not well served by the current media. An engineer is posting: not a ‘scientist’. Its target is the career seeker and also the general public. Metals and knowledge is not enough. Engineers need more than metals and knowledge to benefit the world. There is something else. In late July, 2013 Rolls-Royce sounded a fanfare. In the previous six months the engineering company had made sales of £7.3billion. That’s nearly £40 million of stuff and services sold per day. They were very pleased about these numbers as each was an increase of around 30% compared to the previous half year. The customers seemed to be pleased enough too because they had signed on the dotted line for more stuff and services in the future at a total price of £69 billion. Now you don’t run that sort of operation with a few guys in a shed out the back and some cash in hand. Such an operating company needs to buy stuff, pay 40 000 staff and pay for continuous research. These costs go up and down with time as does the sales income and they won’t be in phase. You will have guessed by now that the extra ingredient needed is – Money. ‘Shed-loads’ of it. Although I haven’t worked it out, it will be more like ‘sports-stadium-loads’ of it. At around the same time as those numbers were announced, the market had invested in Rolls-Royce some £22.5 billion. Only Big Pharma and Big Oil are in the same UK league intellectually and financially. This is a fact for every engineering firm in the capitalist economies: they all need money or capital to operate on the large and economical scale. Hence the name: ‘capitalist economy’. Usually money comes by way of the firm borrowing it from people who expect to get a bit extra back or by generating its own wealth by holding back some of the profits made. Not all need as much as Rolls-Royce; smaller firms need less. All this is engineering too. Sir John Rose knew all about that. Posted on July 28, 2013 Categories Current News, Engineers in the WorldLeave a comment on Metals and knowledge is not enough. 3D Printing – Gift or the End of the World? 3D printing is appearing more and more often in the media. Admittedly, it is mostly in the more excitable screeds, but nonetheless a lot of people see it as a game changer. But then they would: writing about it makes media content to sell. 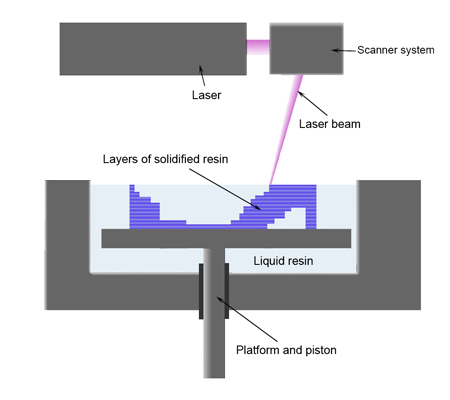 A more technical name is stereo-lithography. This gives a clue as to how the idea works. It is like printing slightly different images on successive sheets of paper from your printer. Cut out each image and stack them up and glue them together and, lo, you eventually get a solid shape. This is how the 3D process works. Image thanks to Materialgeeza. Some internet enthusiasts claim that it will let anyone make anything and everything in their office or even their bedroom. “Buy nothing ever again: just copy it from the internet.” They are apparently almost wetting themselves in their excitement. Others on the other side of the divide forecast the end of the world as we know it. Anyone will be able to make guns from freely available data files from the internet. Horrors! Even that device has to have at least one metal part – the firing pin. Made from a nail, since you ask. The Lad would be wary of going near to such a weapon being used, let alone lifting it near to his head and firing it at someone Wouldn’t you be wary of it exploding into a myriad pieces like an old blunderbuss? Or even one part splitting under the propellant forces, taking your face with it. 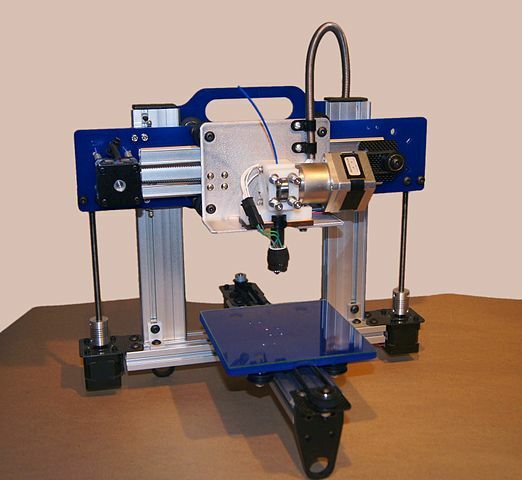 The fact that 3D printers currently cost a fortune and are large is the central problem at present. This may not always be the case though; they may follow the same path as computers whose prices dropped like a stone over the years. The picture is of a simple machine. Actually the idea has its uses now. No doubt more will appear in time. Because it is expensive and fairly slow and available only in a small range of not very capable or strong materials, its main use is to produce models of hardware straight from CAD designs on the computer. Prototyping it’s called: making model parts without complex machining set-ups. OK. Let’s get down to the nitty-gritty-the essentials. Yes, it’s engineering again. It’s all about the material of the parts. How much of your world is made of plastic. Yes, quite a lot but nowhere near everything. Even in your computer, the heart of the nerd’s world, much is made of metal especially the strong, structural parts and the electrically-conducting parts. Most load-bearing things everywhere are metal. Of those that are not, the majority are composite materials; not yet possible stereographically. Also, see the gun firing pin mentioned above. 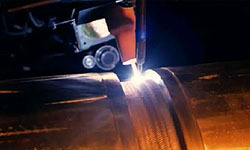 Many of those metal parts have to be heat treated too to give them enough strength. The Lad’s view is that it is likely that the process will be a nine-day wonder like fluidics. What is fluidics? A previous erstwhile Great New Technology that came to very little. Ask any engineer active in the Sixties. OK, wait for The Lad to be proved wrong. Posted on May 14, 2013 Categories Current News, Design in the World, Engineers in the World, Production Engineering, ViewsLeave a comment on 3D Printing – Gift or the End of the World? Here we have a job lot of three, small but egregious media errors. There was a piece in the paper on one of those wild sports cars that are either never built or only half a dozen are claimed at around £1Million each. It is called the Spyker B6 Venator. Designing a car-any car-involves defining the details of engine, suspension, body and chassis, transmission, electronic control and much else besides. That is a massive, engineering task. Victor Muller claims to be the designer of the Venator. It appears that he started as a lawyer and since has been the owner of several firms ranging from marine salvage to fashion. Not impressive qualifications for a car designer. It sounds like an ego-driven dream. The other day Miranda Krestovnikoff, a zoologist and usually reliable TV presenter, had a piece on learning from other species. How do those little tree frogs cling to a wet leaf? Not only that, they can then stop clinging and off they walk. Marvellous. Miranda spoke, on The One Show , to Professor Anne Neville, of Leeds University, who told us she is investigating how the little creatures do it. This splendid skill could let a tiny machine that she and her team is designing cling to a surface inside the human body and even move around. Such a device could carry a video camera to show a surgeon using keyhole surgery exactly what she is doing as she works. Our zoologist called Professor Neville and her team, ‘scientists’. No, they are ‘engineers’. Professor Anne Neville is a qualified and very senior engineer and is Chair in Tribology and Surface Engineering, School of Mechanical Engineering. Check her out. If this is called a quibble, then The Lad must ask if a zoologist would be embarrassed to confuse a shark and a dolphin. Engineers design machines and scientists investigate the natural world. Engineers designed the system and created the valves in Miranda’s SCUBA gear and scientists investigated nitrogen in the blood and wrote the diving tables she uses when diving for TV. It’s maddening. Engineering is mostly ignored, but then, when it does come up, it is often treated like this. This is an example of Bower Bird syndrome [attraction to shiny baubles]. I am sorry but it was The One Show again. It’s nothing personal; just the limitations of the sad, viewing habits of The Lad. Advocates claim the name Aerogel for a weird type of stuff. It appeared in an item on unusual materials fronted by Marty Jopson. Marty comes over-as always-with an engaging screen presence and calls himself a ‘Science Bloke’ and started out as a props designer. Aerogel is a remarkably low density foam hence its nickname of ‘solid smoke’. Marty marvelled over it and gave one of his demonstrations. Now these are normally very enlightening and very interesting. This time, he showed a small block of the foam with a chocolate resting on the top of the block. He lit a blow torch and passed it underneath and played the flame on the bottom of the block for a few seconds. The Lad has to be honest: he did not time it but can assure you that it was, undoubtedly, shown on screen for no longer than 15 seconds. Glass fibre insulations blanket could, probably, perform similarly. Perhaps you have never heard of the ‘solid smoke’ before? No? The Lad had but is not surprised. He had assumed that it had been invented somewhere around the 1980’s. Looking into it he was surprised to find that its precursor had been invented in the 1930’s – over 80 years ago. Why have you not heard of it? This engineer will tell you why. It is because it is useless. Now, now Lad, don’t exaggerate: it has been said to have been used in those hotbeds of value-for-money – NASA spacecraft. Many years have passed without a job. It is one of those curious things that are sometimes tagged as a “Solution in search of a problem.” Note that the only organisations making it are universities. The Lad has been unable to find a single commercial organisation offering the stuff for sale. Look at real, valuable engineering innovations instead. One is the OrganOx matra which is the subject of my next two posts. Do not allow yourself to be led by the nose to marvel, uncritically, at space-filling items either journalistic or foam.